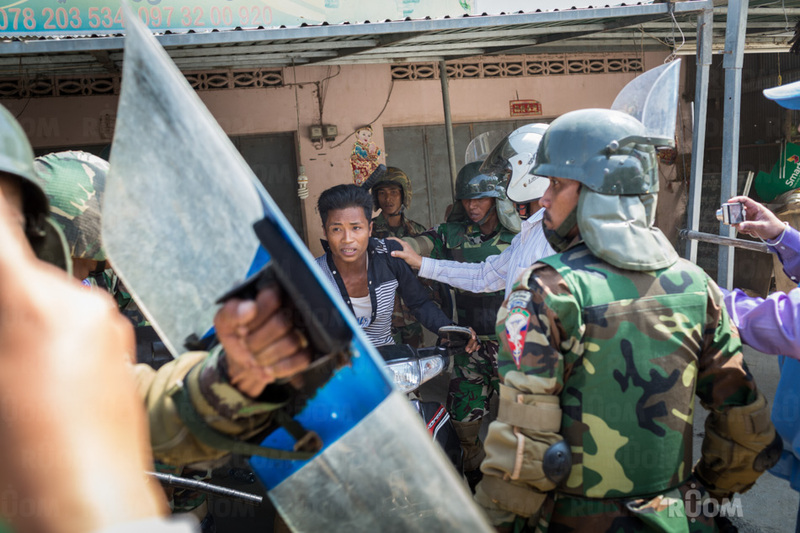 On January 2nd, a standoff between striking factory workers and members of the Cambodian army’s 911 Airborne Unit erupted into a sudden and unexpected street battle, which ended with the arrest of 10 protestors – including monks and union leaders. 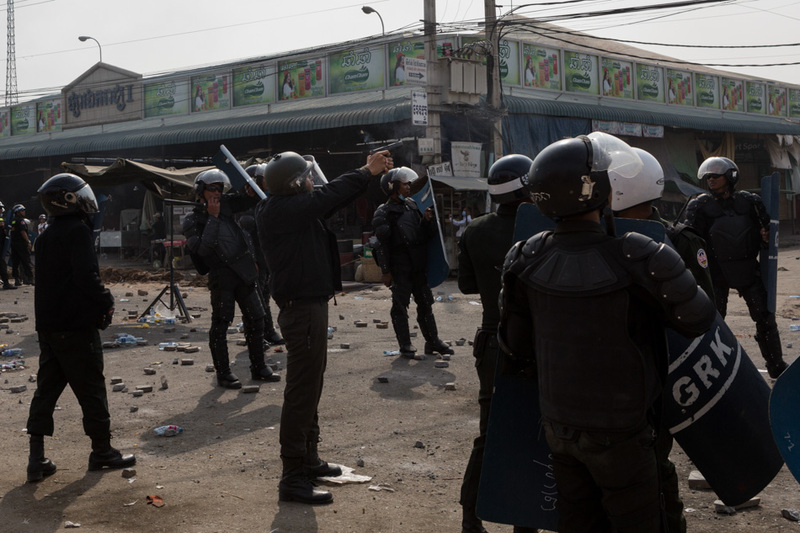 Several hours later, police forces aggressively dispersed a similar demonstration across town at the Canadia garment factory, reportedly beating several of the female protestors. In response, residents of the area surrounding the factory blockaded the roads leading into the neighbourhood and started street fires – refusing to leave until hundreds of police stormed the area. Though the street was cleared without heavy resistance, the more militant protestors occupied a large apartment building nearby. A siege situation developed, lasting late into the night. During repeated attempt to storm the structure, several police officers were injured. Ultimately the police were unable to clear the protestors from their stronghold and returned to their base, but the stage had been set for what was to come. Early on the morning of January 3rd, the protestors returned to man their barricades. Police arrived to retake the area, this time firing live rounds rather than wielding rubber batons. At least four people were killed. Though the main body of resistance was broken, smaller groups faced off against police and special forces units throughout the morning. On January 4th, seemingly intent on preventing any further protest, police surrounded Freedom Park, the major rallying point for the Cambodian National Rescue Party – the main opposition party. Uniformed officers and plain clothed citizens, armed with wooden rods and pieces of rebar, forced CNRP supporters – largely comprised of rural seniors - out of the park. For the next hour they destroyed the tents and stage that had been host to rallies since October. The long-ruling CPP seems to have decided to decisively stamp out its opposition, but it is unclear what this means for the future of Cambodian democracy. Ruom photographers and writers were witness to all of these events as they happened, and our work was featured in The New York Times, TIME magazine, VICE, and BBC News, among many others. As the events continue to unfold, Ruom will be there to report.